Hello all. I'm a new flashaholic. I have a modest collection of production lights at this point, 6 or so. I've recently acquired an Eagtac D25C ti, in the hopes of staving off dropping half a grand on a haiku. It's a very nice light, but the obsession rages on. I know why I want the haiku... that absolutely perfect beam, precision machining, reliability, the fact that they last forever, and superficially because of the prestige. But for anyone who owns or has handled both the Eagtac and the haiku... could you compare and contrast the two lights for me? I just want to make sure I won't be let-down because the haiku didn't blow me away or whatever. Thanks. If you are familiar with SanReMu and Sebenza, that might be a starting place in thinking about this. Yes. In fact, I did make a post in the intro forum yesterday. Not sure where it went. I am also a long-time knife knut. I've owned several sebenzas over the years. Always thought of them as kind of the benchmark for "luxury" in knives. And conversely, I always thought of Sanremu's as counterfeit versions of the sebbie. So you're saying my EagTac is akin to a cheap chinese knock-off of the Haiku? If so, that's good news, and certainly makes it easier to take the plunge. I was thinking that there wouldn't be a huge jump in quality, especially to a newbie like myself. Without getting into differences between homage / clone / counterfeit / fake / knockoff / etc, and leaving aside any disparagement aspect ... yes, there is an obvious quality (and price) differential. The Haiku, in my opinion, was the culmination and refinement of one man's vision and passion as to what portable handheld lighting should be. The Eagtac was designed by committee to fill a market niche at a price point. Both work as intended, but there is no comparison in use. Your mileage, it may vary... Welcome to CPF, by the way. "Rage, rage against the dying of the light..."
I own both. Honestly, the Eagtac is junk. Mine was a dedicated nightstand light. I might have carried it a handful of times. After two years of very light use, the light starting acting erratically. The switch has failed. Eagtac said they would look at it if I sent it back....to China. I will never buy a Chinese light again....ever. The Haiku is perfect in every way. It is superb. Period. Last edited by dtmbinb; 04-07-2018 at 06:25 PM. I had a dream light, which I thought I would never own as they're not made any more. Then last year imanaged to find all the parts to put it together. i was worried that once I had the light all the magic would disappear. On the contrary, every time I pick it up I glow inside. I use it every day as i don't believe in leaving them on a shelf. If you buy a quality light you won't regret it, although it will stop you even looking at the lowlier ones, which you may consider a drawback. I only have a dozen or so lights, but they're all gooduns. I'm looking for a used or dead Ra Twisty. Please PM if you have a spare. Also looking for an MD4 tube, no tailcap necessary. My original Haiku has been clipped to my pocket since early January 2010. This light is timeless. To the original OP, just get it, and don't look back. It will be the best decision you have made in a long time!!! And the Throp, and spare parts... just order them!! In the long run, the Haiku is the cheapest light to own. It will be the last light you ever need to buy. Thanks for all the advice everyone. I've got a bunch of knives on the bay right now waiting to find new homes so I can get the last flashlight I'll ever need. ... just kidding. I'm sure this is just the beginning. If you “get” the Sebenza, you will “get” the Haiku... Do you get what I mean?? Last edited by archimedes; 04-10-2018 at 11:03 AM. Trust me, it could be the last light you may need, however, it will be far from the last McGizmo you will ever own. Many, many more will arrive from Hawaii! Remember, all of us here started out with one, and well...your logic is flawed, you just don't know that yet. Now with that said, you will have the best, from the nicest guy that makes custom flashlights, get the McGiz! You will love it! Some people really have a way with words. Come on, man you can't just have one McGizmo. I think that is impossible. For me, It started with the Haiku clipped to my pocket for 8 years, the the other Haiku , the red Haiku, the Sun Drop, the Mule, and on, and on, and on, on, and on. Last edited by RedLED; 04-10-2018 at 11:44 PM. I know the feeling. Picked up a Haiku about a month ago, already thinking of a Sundrop to add. 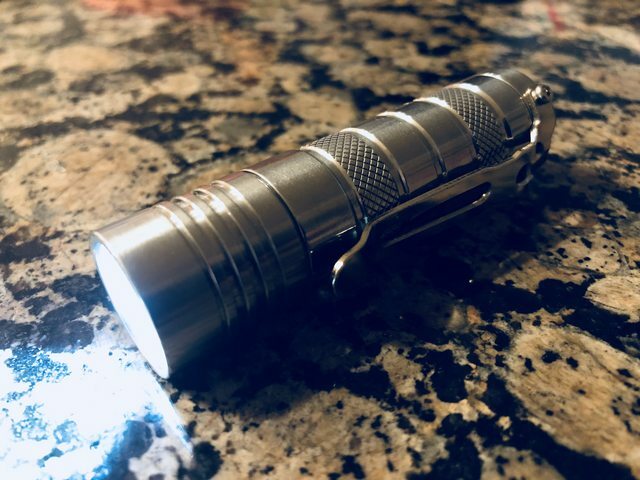 I know this is a flashlight forum, but I picked up a small seb Insingo a few months back and it has been in my pocket since (replaced all m other edc's). Haiku in a holster on my left side, seb in my right front pocket. I want a Makai now. Sebenza and Haiku will be all the EDC you will ever need. Unless you need to dress it up, then a Mnandi and Sapphire will do nicely. Dang, I need a Sapphire.